This is a meal that every Sindhi child has made faces over at the dinner table while dawdling over their food. But by the time that Sindhi child has grown up into a Sindhi adult, they begin to crave it with an intensity that is only matched by their craving for home. When I was the Sindhi child making faces at Sai Bhaji — which translates simply to ‘greens’ — no amount of talking up by my mother about how this meal is a nutritional powerhouse mattered to me at all. Now as an adult (and a mother myself) I’m thinking — a delicious, simple-to-make, nutritional-powerhouse meal-in-a-pot! What’s not to like? 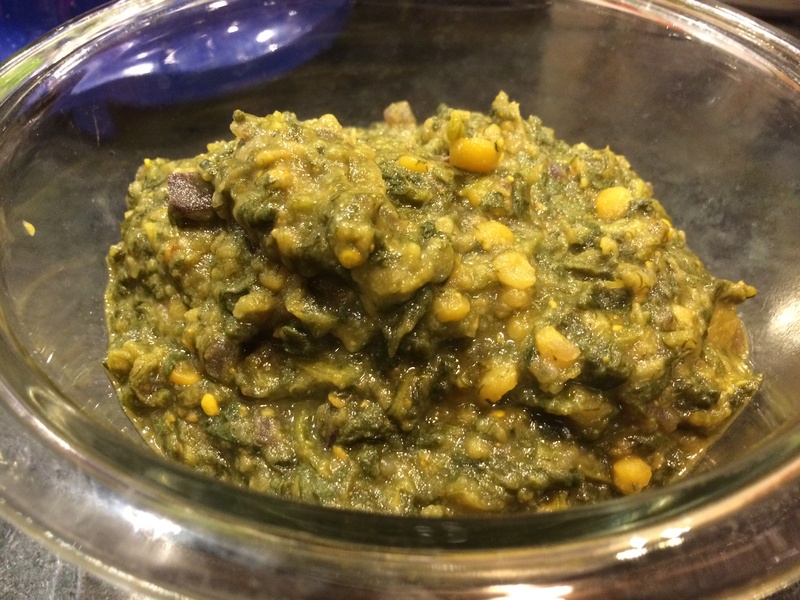 Sai Bhaji is a stewed concoction of spinach and other greens, some lentils, with other veggies thrown in. It is eaten with rice and plain yogurt and possibly something fried on the side. One of the selling points of this dish is that you can throw in basically any vegetable you have lying around in portions that are too small to make a meal themselves. 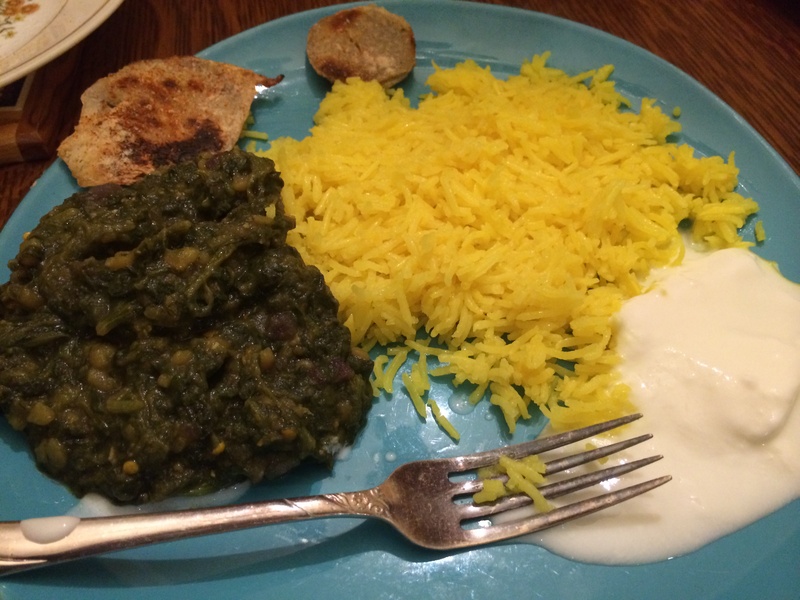 The taste of spinach and dill is strong enough that all these mini-portions will be swallowed, subsumed, absorbed and spat out as part of the Sai Bhaji empire. Thus adding even more nutrition. Two tablespoons channa dal, soaked for half an hour at least. 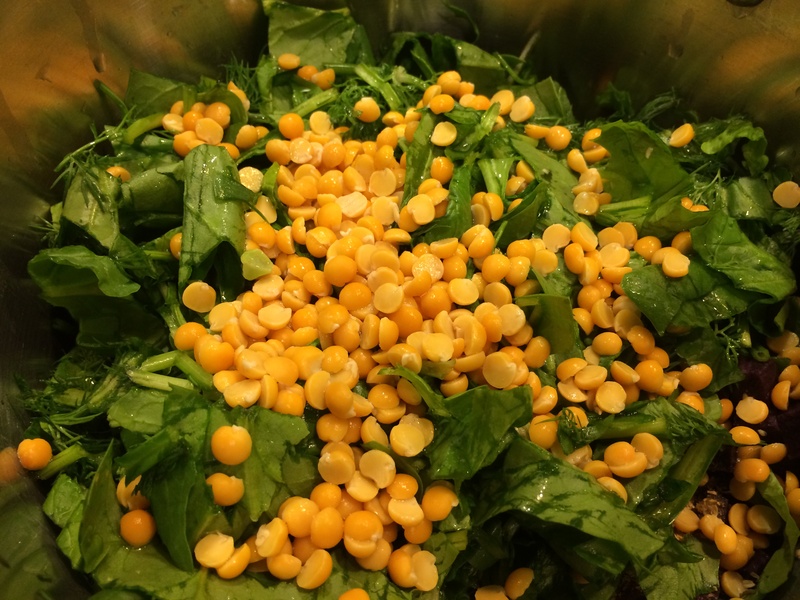 This post talks more about channa dal. Optional: 1 cup of other chopped vegetables, such as eggplant, zucchini, tomato, carrots, bell peppers, etc. 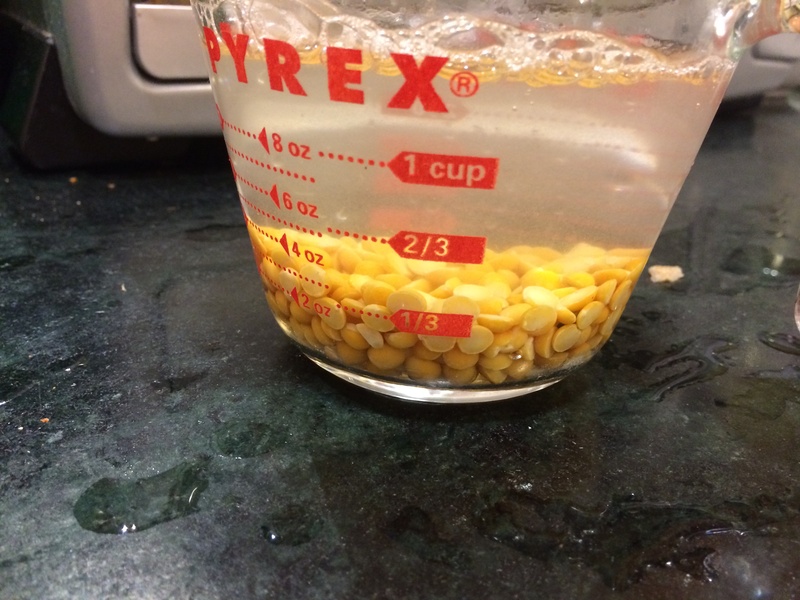 Have the channa dal soaking in plenty of water for about half an hour. 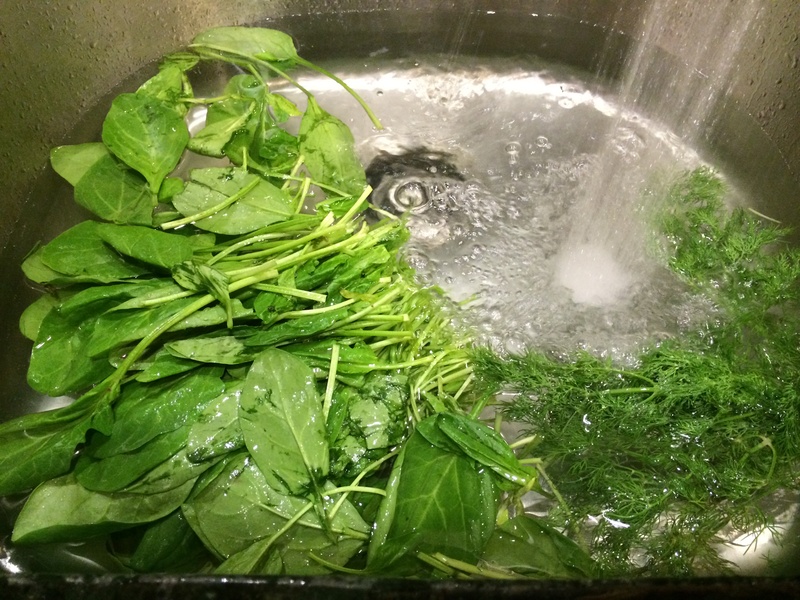 Wash the green thoroughly in a sink full of water a few times. Chop them up roughly including the stems that are not too woody. Now start layering the dish in a thick-bottomed pot with a well-fitting lid. First, the oil. Then, the onions, chili and ginger. 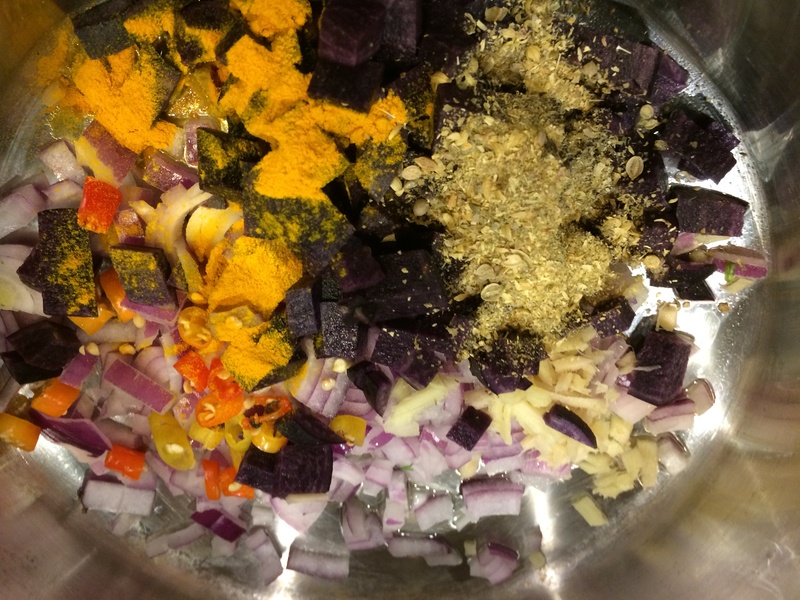 Then, the potatoes, and the coriander and turmeric powders. Then about half the greens. Sandwiched between this and the other half of the greens throw in the drained channa dal. 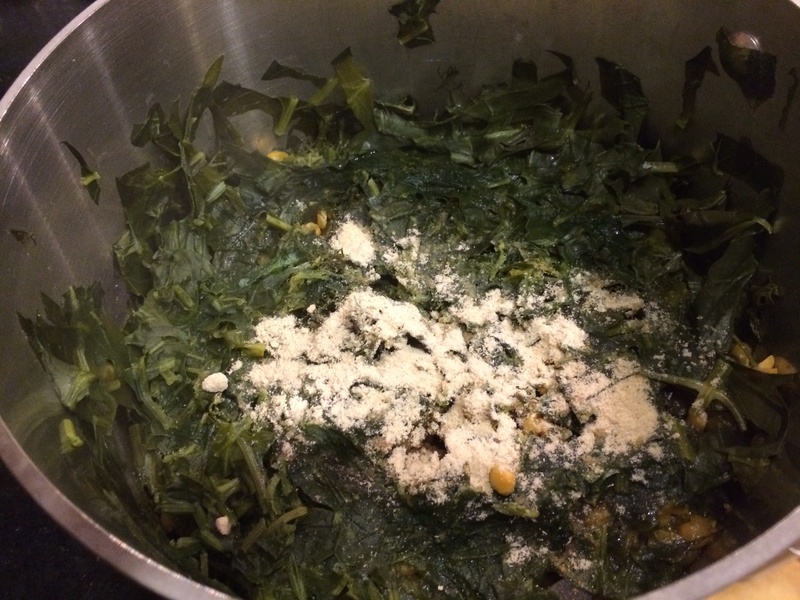 After the last of the greens, sprinkle the salt over, cover, and bring to a boil. 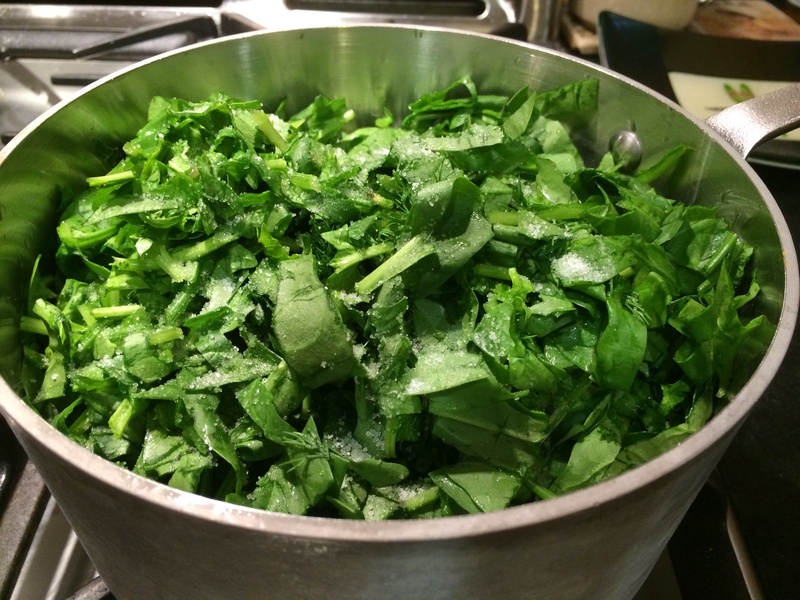 The water from rinsing the greens should be enough to cook, or add about a quarter cup if it seems dry. Once it comes to a boil lower to a simmer and let it be, covered, simmering for about 45 to 50 minutes. When you open the lid, the lentils should be softened and the greens cooked down a lot. Add the dry mango powder or lime/lemon juice, and mash it with a potato masher or the handy-dandy mandheera. Warm it through before serving. This is generally eaten mixed with rice and plain yogurt. Three types of rice dishes work well: rice browned with onions, khichdi rice, or yellow garlic rice (recipe forthcoming). Far be it from me to dictate which way you choose to eat it, but you won’t be sorry you did. ← What is this ‘sinfully delicious’ you speak of? Now I’m hungry after reading this! Seems like it would go very well on one of these cold days. Shoshannah come over and I will make it for you. Looks so…good!! Wish I was a Sindhi child whose mom would cook her this meal. 🙂 But, I can always be a Sindhi adult now, and cook this for myself! Thanks for an excellent recipe. XOXO, Angie. Angie when my husband first had this he was an adult. But lucky him — he has a Sindhi wife and it was love at first sight for him (with Sai Bhaji). I love Sai bhaaji. 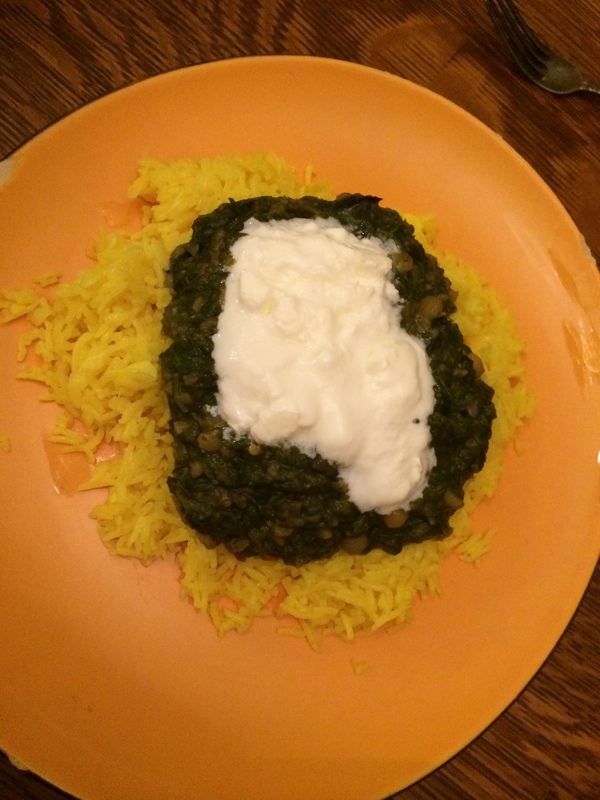 Thanks for this authentic recipe…trying it out real soon. 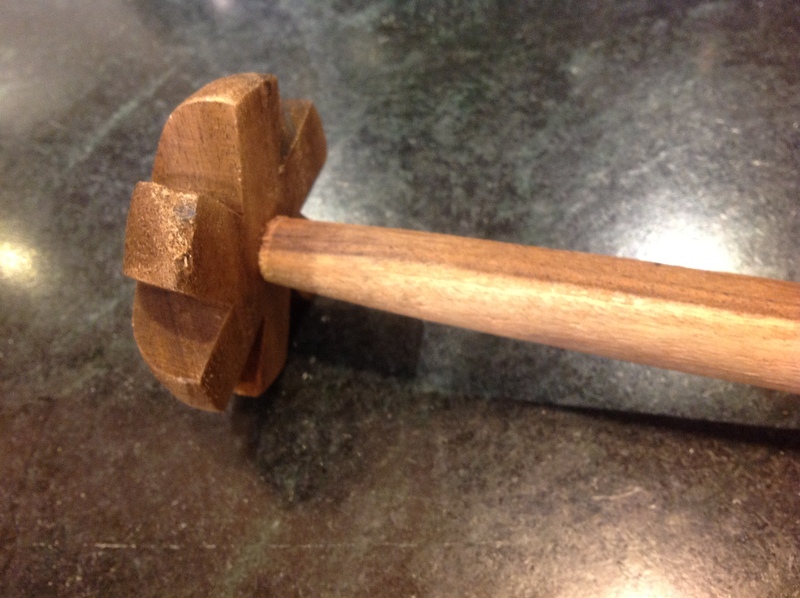 This is how we made it in my family…other families probably have different takes on it. Doesn’t everyone have a story like this! I was introduced to Sai Bhaji very late in life and loved it instantly. The version I make has “Khatta Bhaji/Ambat Chukka” and “Methi/Fenugreek Leaves” as well… 🙂 It is quite a medley of tastes. Thanks Anil we made those leftover cutlets too, although I haven’t had them in years. Thanks for reminding me! Awesome recipe! Did this for dinner today, and of course added a full bunch of Dill (I am a Dill fan), added a cup of carrots too. This must be a sindhi comfort food 🙂 Did not have time to do garlic rice, just cooked plain steamed rice. Go Aneela! Glad it worked out! Carrots are a good addition and full of vitamin A too. Hope you had plain yogurt!